Please note that all Le Cache Credenza cabinets has a back vent exhaust and therefore requires 3" clearance at the back. Please choose your color option below. *Fully-assembled dimensions with moldings. 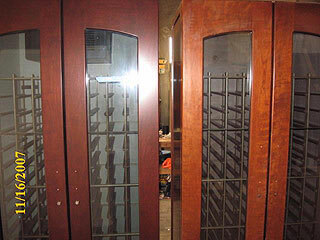 Pre-assembled, insulated wood cabinet regulates proper temp/humidity for long-term aging of Red and White wines. Universal Racking 3 11/16" opening - fits standard and some oversize 750mL bottles. Pigeon holes are open so the bottle can protrude to top, bottom and sides of the assigned space. Steel refrigerator hinges. You won't see the hinges unless you're looking for them. 1" required on each side to allow for opening of door. 18" needed on top of contemporary cabinets, 13" for the Euro Series. Le Cache wine cabinets are constructed from the finest wood, glass and insulation materials. Cherry wood is used for the exterior, with hardwood cherry doors, double-pane tinted glass windows, 1 1/2" foil-backed expanded polyurethane insulation and sealed seams throughout the cabinet. With Le Cache's unique SB/O™ Technology (Zero Set Back) there is 0 clearance required behind the unit. So the cabinet can go right against the wall. 18"(Contemporary) OR 13"(Euro)of unobstructed clearance is required above the cabinet. 1" is required on the sides of the cabinet to allow the doors to open if built into cabinetry and flush with the front cabinets. The side clearance is only required for the door and not for the cabinet itself. If building it in then you may need to look at purchasing some kind of thermostat-controlled exhaust system to evacuate the hot air above the wine cabinet when it exceeds a preset temperature. But ... this is such a beautiful cabinet, you wouldn't want to build it in! What if you don't have the required 13" or 18" clearance available on top of the cabinet? The cabinet can be modified prior to shipping so the air intake will pull from the back or the cabinet, as opposed to above. Please note: in this case, you can no longer place cabinet flush to the wall, you will require 3-4" clearance at the back of the unit AND still need 8-9" above the unit. You need to specify this modification at time of ordering, as standard units are sent "hot air up" to allow for zero clearance at the back. There is no upcharge for this modification. Please note that the "credenza" has a rear vent exhaust and therefore needs at least a 3" clearance at the back. 1800-QT Super quiet operation, designed for cabinets to be placed indoors in residential applications. 1800-XT - Extra cooling power, designed for larger cabinets and/or warmer environments and/or commercial applications. 1800-XTS - MOST powerful - more $. Please note - If the Le Cache cabinet will be placed in a restaurant, commercial environment or hotter locales then customer needs to upgrade to a CellarPro 1800-XT Model cooling unit, or cooling unit warranty will be void. Dual-zone (two temperature zone) modification available for the larger Le Cache wine cabinets. Provincial is a medium brown finish. The side by side comparison above shows a fairly close interpretation of the product. The Provincial is browner & darker than many of our on-line samples represent. Classic has more of a reddish finish on Cherry. Chocolate is a more opaque chocolate finish but still allowing you to see the deep richness of the wood. Le Cache finishes. Individual computer video settings may skew the color representation. As these cabinets are solid wood, you will see the natural grain associated with cherry, the pictures do not really show the true beauty of the cabinets. Standard Shipping Terms & further detailed shipping information about stairs and specific placement in your home. What does SHIPS WITHIN 3-5 DAYS REALLY MEAN? It means it is available as a STOCK ITEM and will be prepared by Le Cache for shipping within 3-5 days within order. However, upon leaving the factory, the delivery company needs time to deliver the cabinet usually a 3-4 week timeline is the norm. While other dealers may actively promote 3-5 day shipping that is not a realistic timeline for you to actually receive the cabinet. The base and crown for the Euro Series are shipped in a separate box and installed once the cabinet is positioned in place. If space/maneuvering restrictions are a concern, you should use the size of the Contemporary equivalent to estimate space needed as the crown/base will be added once the cabinet has reached its intended destination. Le Cache Wine Cabinets are readily available for shipping throughout the United States of America and Canada. Le Cache Premium Wood Wine Cabinets contain the American made Cellar Pro. The CellarPro factory in Cotati, California, USA, 94931, North America. Please additional info tab for more information on this series. Click here for Standard Shipping Terms and Shipping Cost to your area & further detailed shipping information about stairs and specific placement in your home. As an incentive to purchase from Rosehill, we will apply $300 Credit TOWARDS YOUR SHIPPING COST!! CALIFORNIA RESIDENTS will also be charged applicable state tax for this product. This additional charge will not be reflected in the shopping cart but will be added on during processing once CA is chosen as the state of delivery. $300 SHIPPING CREDIT for all Le Cache Cabinets!!!! $300 shipping credit for all Le Cache cabinets within lower 48 states & Canada also benefits with reduced rates! Also see detailed shipping information about stairs and specific placement in your home. Please note that the shipping rate on this product is applicable regardless if you wish to pick up at Rosehill or have it delivered. The delivery price indicated includes the cost of freight and all importation fees. As an incentive to purchase from Rosehill we will apply $300 towards your shipping cost within Canada. Shipping Promotion - Limited Time offer - Offer may expire at any time. What will determine your shipping cost if not compliant with standard main floor delivery? *availability of elevator if applicable. • can an 18 wheeler access your home or will a smaller truck be required? What else is important to know about your delivery? • You may want to remove any necessary doors prior to the cabinets arrival to save time. • Your ceiling height must be minimum 12” taller than the cabinet itself to allow it to be positioned into place. Delivery appointments are scheduled within a 4-hour window between the hours of 8 a.m. to 5 p.m. Monday through Friday. If you require a more specific time delivery or Saturday delivery (not available everywhere), additional charges may apply. There are no deliveries on Sunday or holidays. Fuel surcharge will be included in rate quoted. If the cabinet is NOT being delivered to first floor then additional delivery charges will apply to the estimates indicated above. Additional delivery fees may be assessed for stair carries. The rate for stair carries is $60 USD per flight of stairs (except for the Model 5200, whose rate is $100 USD per flight of stairs.) One flight of stairs will be assessed from the 4th to the 15th step. Every 10 steps thereafter is calculated as another flight of stairs. Long carries are defined as distances greater than 100' from where the truck parks to the front door of the delivery site. Any distance over 100' will be assessed an additional rate in increments of 50'. If local delivery or safety conditions considerations warrant the use of an additional person the additional charges will apply & will be considered at time of quote. Additional delivery fees may be required if you are located outside a regular delivery service area. Do not sign any of the shippers paperwork. Please contact while the delivery people are still onsite. 1-888-253-6807.